It’s tough not to like record collector Joe Bussard, subject of the film Desperate Man Blues. Tough, provided you’re not a devotee of rock n’ roll music. Tough, unless you happen to be one of those people laboring under the misapprehension that jazz music has been made post-1933. Tough if you’re not one of the deluded fools whom thinks he has some classic sides available on 78 rpm. Even if you fall under one of these three categories, which comprises about 78% of the population of the United States circa 2006, not liking Bussard seems a difficult proposition. Minutes into Desperate Man Blues we’re treated to the bubbly and idiosyncratic personality of Joe Bussard. On the opening cut he’s found smoking what is to be an omnipresent cigar and grooving to a prewar vinyl. Aficionados of air guitar will be as entranced with Joe as record collectors and old time music enthusiasts. Within minutes, the audience is treated not only to air guitar, but air clarinet, air fiddle, air trombone and even (this may be the only recorded case, which would suit Bussard fine to be sure) air Weissenborn. All this while dancing contagiously. Joe began collecting 51 years ago throughout his native Maryland, Virginia and West Virginia. A few side trips into Georgia, South Carolina and North Carolina are certainties. Just like that barracks buddy your grandfather was acquainted with in the Great War who kept his copies of The Fantastic Four intact, Bussard had the vision to see treasure in another man’s rubbish. He relates tales of collecting at a time when pre-Depression 78’s were viewed as throw-away items. In the 1950’s the original owners saw little value in what are now priceless records in Joe’s collection. A case in point. While hunting records in the Piedmont he came across an African-American man who had sold Paramount Records from his home. The humble tin roof shack didn’t have electricity. Simply a gold mine, including a copy of Charlie Patton’s “.32 Blues” which we’re treated to as video guests in Joe’s basement. This is only a pebble on the mountain that is his collection. While doing his once-a-decade interview with The Frederick Post, he plays an ultra-rare mint copy of Robert Johnson’s “Crossroad Blues” on Vocalion. “Rock musicians… will pay anything for it, and they’ve got the money.” One feels Bussard isn’t selling. Only minutes before, he’s quoted as saying that “rock is the cancer of music,” and referring to a 1933 side as “around the end of jazz.” Though his enthusiasm for true American roots music is infectious, he does come off as a trifle monolithic. So is the dichotomy of Desperate Man Blues. Though one would be hard-pressed to find a person more moved by classic American music than the film’s protagonist, a rye straw elitism creeps in, making the whole issue a bit unseemly. Naturally, a serious collector… and Bussard is as serious as they come… will tend to fall victim to a Manichean standard. We’re talking about a fellow who has a Scotch reel-to-reel of his own recording of Clarence Ashley singing “Coo Coo” at home. Impugning his taste would make a fool out of the accuser. He sees Jimmie Rodgers as the greatest voice in American music and Uncle Dave Macon its greatest all-around entertainer. Hard to argue. Joe Bussard’s massive collection is his pride and joy, but he seems to share it freely through his radio program and a very inviting Southern hospitality to visitors. Who among us would hurl accusations of elitism at such a man, who is instrumental in preserving our greatest gift to humanity? As the spectacular stills and performance footage collected for the film would attest, he certainly has a point. This point would be welcome on a nationally syndicated radio program, in addition to his local one. 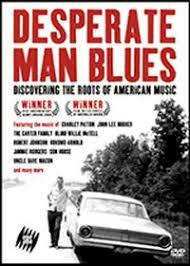 Given the broad appeal that Desperate Man Blues (named after the A.P. Carter side “John Hardy Was a Desperate Little Man”) seems to aim for, we might all come to the realization that we’ve been listening to crap all along. Review this film and others. Greetings, We would like Joe Bussards Email Thanks, Dale.